Many musicians dream of a chance to perform at Carnegie Hall. Classical guitarist Peter Fletcher has played at the historic concert venue in New York four times. His most recent show, in March 2010, was sold out. Fletcher will take a different stage when he performs the music of Bach and many other composers at the Tualatin Public Library at 7 p.m. November 7. Fletcher said he does not approach a library performance any differently from a performance in a prestigious music hall. Audiences will leave his performances with a similar sample of his musical talents, but might experience more. Peter does the same performance he would do at Carnegie Hall as he would in a library. Fletcher began his illustrious career playing on a baritone ukulele at the age of six, but that wasn't good enough for the music loving first grader. By the time he was seven, he was taking classical guitar lessons from John Sutherland, the author of "Everybody's Classical Guitar." Peter started with classical guitar because Sutherland said it would make a good base no matter what style of guitar he wanted to play. Peter loved it and decided to stay with it. The concert will feature selections from Fletcher's 2008 CD release on Tower Hill Records: Music of the Baroque. Other repertoire will include Jesu, Joy of Man's Desiring from Cantata No. 147 as well as the Chaconne in D minor by J. S. Bach; Usher-Waltz, an unusual and intense piece by Russian guitarist and composer Nikita Koshkin; two works from Maurice Ravel's exquisite Mother Goose Suite; Francisco Tarrega's ever popular Recuerdos de la Alhambra; two exciting crowd pleasers by Spanish composer Joaquin Turina; Grieg's Chanson de Solveig from Peer Gynt; and music of Praetorius, Ponce and Reusner. The program will culminate with Koyunbaba, by composer/guitarist Carlo Domeniconi. 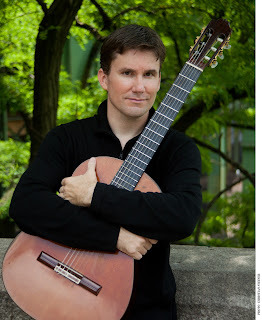 This is one of the most unique and exciting works in the classical guitar repertoire. Proclaimed Peter Burwasser of Fanfare Magazine: "Fletcher plays it all with a gracious virtuosity that makes for a very pleasing hour plus of unaffected musical poetry." Find the Hillsboro Public Library on Facebook!